After working as a coach in Argentina for almost a decade, I emigrated to the United States in 1998, looking for some fresh air. I’ve stayed in New York for five years and this experience strongly marked my personal life: I became a fan of the city, got married, had my first child there, but professionally I felt that I wasn’t learning as much as I wanted. Despite that, I still keep in memory one of the jobs I enjoyed most as a coach: teach tennis on the courts of Central Park every summer day at 7am. People would turn up every morning, and you never knew who would come to play. This uncertainty and the need to adapt to different players every hour fascinated me. After the attack on the Twin Towers, the city changed a lot and a year later I moved to Europe. After a brief stint in Italy, Barcelona gave me the opportunity to work on clay courts again. At the Gimnastic de Tarragona, I began a new stage of my life and during four years I learned the secrets of Spanish tennis, and especially the Catalan tennis philosophy (and enjoyed the birth of my daughter). The CT Reus Monterols hired me in 2008 and there I enjoyed a social and professional environment where I always felt really comfortable, with exceptional colleagues. But two years later, the CT Tarragona offered me a very tempting challenge: take charge of the mini-tennis group, which by that time had more than 100 children. A high-level club with very good facilities and important events (Challengers, Spain Championships, Senior ITF tournaments…). This club also allowed me to do the work I enjoy most: to train players. The two groups of Tennis Base (mini-tennis and pre-competition) with boys ranging from 3 to 9 years old, made me grow as a professional and got the best of me. A year ago, I started a Facebook page called Miniplayers where I post photos and videos of work done with these groups. Together with my friend Abel Rincon I founded a solidarity movement called #TennisAid whereby we collect sports equipments and offer them to friends who coach in countries with fewer resources. In November 2014 we made our first trip to Kampala, capital of Uganda and last May we were in Kep, a small coastal town in Cambodia. Both experiences, especially the first one, have profoundly marked us. I am also very fortunate to have been invited to speak about my work with children and solidarity trips in cities like Cuenca, Zaragoza, Valencia and Barcelona (during the Barcelona ATP tournament). I am now facing another challenge: to take as Director of junior tennis at FC Sant Cugat, Barcelona, where I hope to put into practice what I have learned over these 25 years touring club worldwide. (Words by Martin, translation by Tennis Buzz). 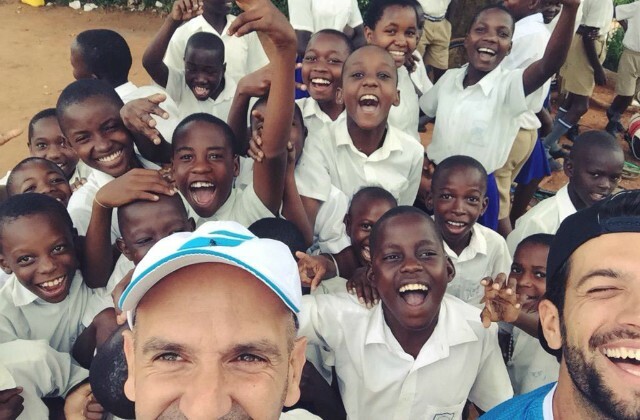 Update: read the story of Martin’s second trip to Uganda.